The call below to South Africa's ruling party, the African National Congress (ANC), was first circulated on the 19th of October 2012 and within a week was signed by over 150 former international anti-apartheid activists. It has the support of signatories from more than 19 countries, belonging to over than 35 organizations. 3) the country in which you were (most) active. We -- former international anti-apartheid activists -- supported the African National Congress (ANC) and the people of South Africa in their fight for liberation and against apartheid by mobilizing support for boycott, divestment and sanctions against the South African apartheid regime. We succeeded to put the crime of apartheid on the agenda of political parties, trade unions, churches, non-governmental organizations, artists, sports bodies, universities and concerned citizens. We called on people not to buy apartheid products and we discouraged tourism to the country. We campaigned for a weapons embargo, an oil embargo, a Krugerrand boycott, a sports, academic and cultural boycott. We pressurized companies and banks to withdraw from apartheid South Africa. We mobilized thousands of people to participate in demonstrations against apartheid. 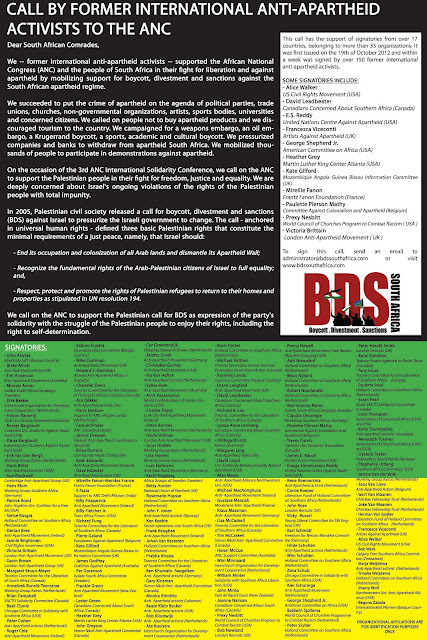 On the occasion of the 3rd ANC International Solidarity Conference, we call on the ANC to support the Palestinian people in their fight for freedom, justice and equality. We are deeply concerned about Israel's ongoing violations of the rights of the Palestinian people with total impunity. - Respect, protect and promote the rights of Palestinian refugees to return to their homes and properties as stipulated in UN resolution 194. We call on the ANC to support the Palestinian call for BDS as expression of the party's solidarity with the struggle of the Palestinian people to enjoy their rights, including the right to self-determination.